Earlier this month, Professor Patrick De Deckker from Australian National University (ANU) visited the Far South Coast of NSW where he introduced a group of twenty naturalists and school students to the amazing diversity of plankton. Patrick’s fascinating presentation described the plankton found across the Sapphire Coast region and its importance in terms of carbon and silica cycles and food webs generated in the oceans. Patrick is a scientist who pioneered the study of the Quaternary (that is, the last two million years) history of the oceans bordering Australia, using principally microfossils and their chemical composition to reconstruct past changes. In addition, he was the first to link the patterns of environmental change on land and at sea using microfossils and other proxies, found that glacial oceans have become progressively warmer as aridity increased in Australia. Most recently, Patrick is looking at the microbiological and geochemical fingerprinting of airborne dust with the aim of linking dust events with changes in the oceans. Using high-powered microscopes borrowed from ANU, Patrick showed the group how to identify the different sorts of plankton. Samples were collected locally at Eden’s Twofold Bay, both from the shore and further out to where the ocean reaches 60m deep. Other live samples were collected from Merimbula Wharf. 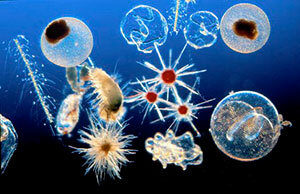 After a shared summary of findings, Patrick explained how plankton is a significant marker of climate and ocean change. Participants enjoyed seeing the plankton under the microscope, learning about its role in the sea and discovering how the ocean is layered with different life. This workshop presented by the Atlas of Life in the Coastal Wilderness and the Sapphire Coast Marine Society presented a rare opportunity for locals to learn from an expert scientist. Patrick’s enlightening presentation has shown us all how plankton identification is a gateway to the unknown realms of microscopic ocean life.